If I told you I’d just listened to an album with moments that reminded me of Barry Manilow’s ‘easy listening’ genius, songs that were Chris Isaak at his crooning best and sounds that were pure Harry Connick Jr pop swing you couldn’t be blamed for thinking ‘What a mess!’ You might also think it a travesty to mention all these artists in the one sentence. 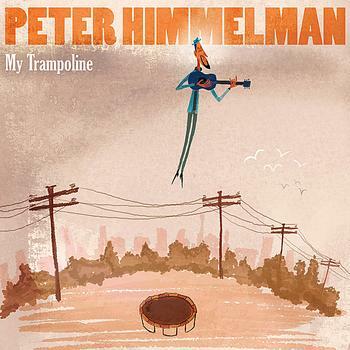 But take a bounce on Peter Himmelman’s My Trampoline and you may be surprised. Peter Himmelman has a long history in the music industry and a breadth of experience, notably on soundtracks including his Emmy award-winning score for Judging Amy. His extensive discography includes five albums for children, the most recent of which is My Trampoline. The album kicks off with the fast paced, big sound of Imagination and then moves down a gear with the seductive title track My Trampoline. I like this one simply because it shows that regardless of age, sometimes we all need boasting rights. Parents will laugh along to Are There Any Kids Named Steve Anymore? while kids will really enjoy the roll-call of kid’s stats on Statistical Factoids which quotes the number of kids brushing their teeth, wiggling their toes in wet sand and feeding their pet tortoises at any one time. The pure rock of King Ferdinand stands out, as does the country and western inspired Workin’, Playin’and Dreamin’ but the real gem on the album is the funny (but meaningful) Main Dish – “…why can’t I be the main dish? Why am I always on the side? Does the cheese want to be the spaghetti?…” The lyrics are all about food but the song is so much more and I’m sure many children will identify with the subtext. So if you’re wondering where Barry Manilow is in all of this, listen to Ten Billion Blades of Grass. It features those anthem-like crescendos that are trademark ‘easy listening’ (and that I admit to a bit of a weakness for). Peter Himmelman’s albums for children are available on iTunes for $16.99 each. The clip below is from the album My Green Kite – it shows Himmelman’s unique ability to put a little humour into a ballad.